There are many reasons to start vegetable plants from seed: it is less expensive, you have control over both quality and organic status of plants and you can pick a healthy, chemical-free potting soil. But best of all, when you grow your own plants from seed, a world of unique plants opens up to you. Growing from seed gives you access to the thousands of varieties available in seed catalogs, garden stores, seed swaps and seed libraries. In fact, the sheer variety may feel overwhelming at first, but if you imagine how you want to use the produce, it will be easier to choose which to grow. Do you want to grow tomatoes for salsa or sauce? Pick a paste-style tomato. Maybe you want savory thick-skinned roasting tomatoes or Italian stuffing tomatoes with a hollow interior? Pick a classic red slicer tomato. Most seed catalogs and garden stores can offer you advice on what varieties are good for which use. More choices also means you can select plants that will do well in your specific environment. Look for varieties that flourish in your growing conditions, whatever they may be. Shorter season veggies do well in cooler climates and dwarf varieties can thrive in tiny spaces. If culinary use and growth habit can’t convince you to start growing from seed, try thinking about it historically. Find a variety that connects you to your community. Seeds, after all, are a living connection to all those who have come before us. An old variety such as "Djena Lee’s Golden Girl" tomato, is still as tasty today as it was when it won first place at the Chicago Fair 10 years in a row during the 1920s. If you’re looking for something more modern, find farmers, gardeners and seed savers who have been growing and saving seed for decades in your region. Not only are these people a wealth of information, but they might be willing to share some of their favorite varieties. Seed swaps and seed libraries are great places to meet local seed savers. Seed Matters partners with Seed Savers Exchange, the oldest and largest seed saving network in the U.S. They can help connect you to local seed savers through community seed projects and their membership network. Now that you’re on your way to discovering new and old varieties suited for your growing conditions and uses, consider using organic seed. Organic seed, like organic fruits and vegetables, are grown without the use of harsh synthetic chemicals and are GMO-free. 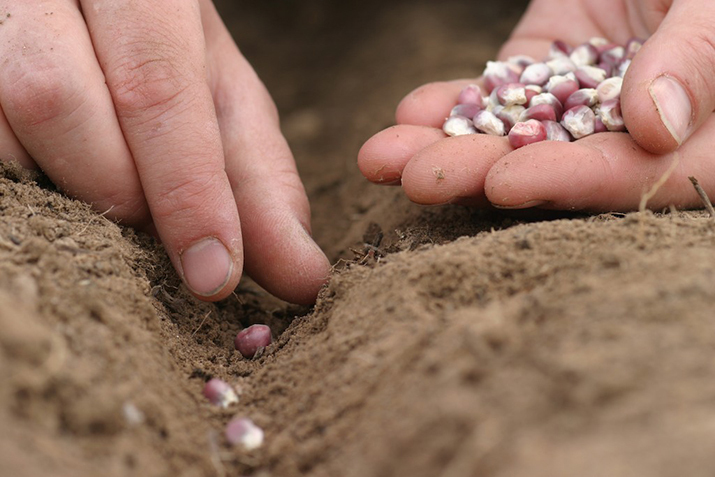 Unlike organic fruits and veggies, seed crops stay in the ground much longer than those grown for market produce, and are able to complete their life cycle and produce seed. For conventional seed, more time in the field means more exposure to pests, diseases and applications of chemical treatments and sprays. Purchasing organic seed also encourages the future development of organic seed varieties. When seed is bred, grown and harvested, selection for certain traits can occur. For example, if it’s an abnormally cold growing season, individual plants with strong cold hardiness may produce higher yields of fruit and seed. Though this won’t change the variety in one season, varieties can adapt and change after many years of selection. The same goes for disease. Organic seed developers focus on selecting and saving seeds from crops that have proven to be naturally hardy and resistant to disease. Creating varieties well-suited for organic agriculture is a slow process; it takes years for breeders to create varieties and release them to the public. Breeders take on risk by guessing what will be important and desirable for farmers, gardeners and eaters in the future. Purchasing organic seed today is your way of telling plant breeders what kind of food you want grown for future generations. Learn more and support regional organic seed development at seedmatters.org. Co-ops support organic. Discover more about delicious organic food and its environmental benefits. Learn more about fair trade and the benefits it provides to both producers and their communities. Co-ops believe in your right to know what’s in your food and how it’s grown. Find out more about food labeling issues.